Read about the initial release of the A-Frame Motion Capture Components and A-Saturday-Night. Or head directly to the A-Frame Motion Capture Components. Room scale VR development becomes molasses. But we’ve come up with a workflow to supercharge VR development so we can automate, develop rapidly, and on the go: A-Frame Motion Capture Components. With the motion capture components, we can record VR actions (e.g., headset and controller movement, controller button presses), and repeatedly replay those VR actions, on any device from anywhere without a headset. Faster test trials: No need to take the headset on and off, enter VR, grab the controllers, do manual actions, or restart browsers. Just record once and develop for hours on a single recording. Development on the go: Rather than having to re-enter the headset and VR every time we want to test something, we can take our recording, send it to, say, a Macbook, head out to a coffee shop, and continue developing our VR application using the recording on a stable browser. Add some console.logs, refactor your application, or freeze the replay with the A-Frame Inspector (<ctrl> + <alt> + i) to poke around. Multiple developers sharing one headset: One developer can take a recording with the Vive and go off somewhere else to develop with the recording, leaving the Vive free for the other developers to use or take recordings. Requests for recordings: Perhaps you don’t have a Vive or Rift handy but your colleague or friend does. Give them a link to your web application maybe via ngrok (isn’t the Web awesome? ), have them take a recording, and send it to you! Now you’re unblocked from developing. 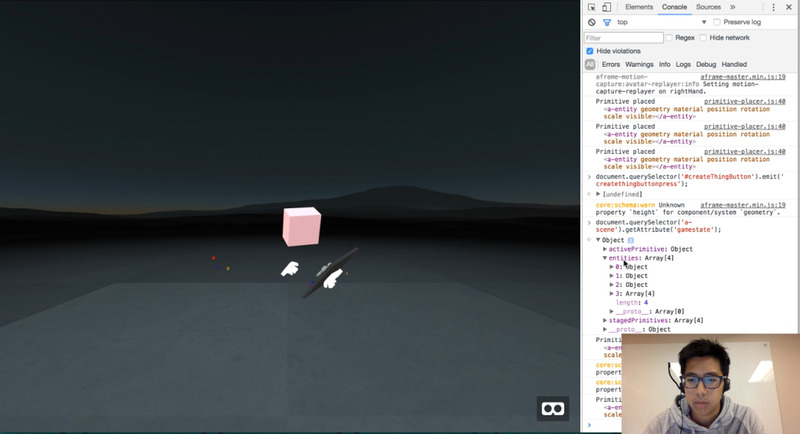 Demonstrating bugs: Or let’s say you found a bug in a VR web application and want to show it to someone. Take a recording and send it to them to debug. No need to give bug reproduction steps, it’s all in the recording! Another use case for motion capture is as an animation tool to create paths and splines, but we won’t go over that here. Now we can replay the recording. You can try recording the camera with WASD and mouse drag controls right now on a desktop. Head to the Record Example, open the browser Console to get feedback, and hit <space> to start and stop recording! Then replay the recording on any device from anywhere without a headset to your heart’s content. Get in the headset, record some clicks, and then from a laptop, we can build event handlers on top of the controller events we emitted in the recording. This lets you view the recording from a third-person view. I found this immensely useful because it was hard to see what was happening in first-person. The first-person view is naturally shaky, hands would occlude the camera, actions would be happening off-screen, and its hard to focus on one place if the camera is always moving away. The Spectator Mode lets you free move around the scene and view at whatever angle or focus on whatever area. Head to A Saturday Night to see a recording in action. Again, check out the Motion Capture Components. Go forth. Rapidly innovate and experiment with room scale VR interactions!